A phenomenon in which, when the palate is lifted, the midline deviates to the normal side and the weak side droops. Palate deviation is seen in individuals who have paresis or paralysis of a hemi-palate due to Vagus nerve injury or dysfunction. It can be observed from either the oral cavity or nasopharynx view; subtle cases sometimes seem easier to see from the nasopharynx view. View of the upper surface of the palate from within the nasopharynx. 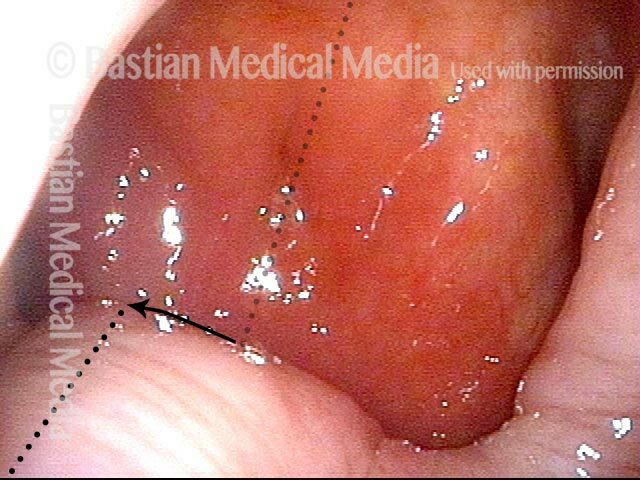 Due to this patient's hemi-palate paralysis, the palate deviates to one side, such that its midline (darker dotted line) no longer matches the nasopharynx's midline (lighter dotted line). This entry was posted in Multimedia Encyclopedia and tagged Diagnostics, Other useful terms, Photos by admin. Bookmark the permalink.